Jimmy “The Iceman” MacNeil is a graduate of Wilfrid Laurier University (1984). 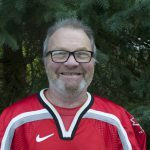 He is employed by the City of Brantford as a rink operator, making ice and driving a Zamboni Ice Resurfacer! Jim and his wife, Lori, live in the County of Brant with their children: Jordan, Jenna, and Jake, as well as an assortment of family pets. 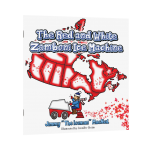 In 2002, Jim embarked on one of the greatest adventures of his life: The Official Zamboni Ice Machine driver of The Goodyear “Drive For Gold”, driving a Zamboni Ice Machine across Canada! His first children’s book, published December 2017, tells the exciting tale!